The world on the bring of Chaos! Grande Carte en Couleurs du Théatre des Opérations de la Guerre Mondiale. 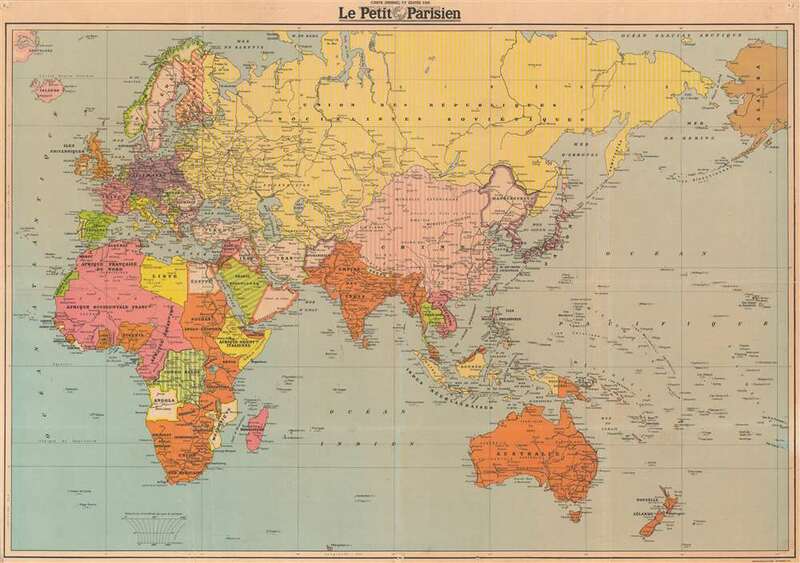 This is a 1939 Le Petit Parisien world map illustrating the state of hostilities before the Spring 1940 offensive in World War II. The map depicts the world from the Atlantic Ocean to Alaska and Hawaii and from the Arctic Ocean to the Cape of Good Hope, Australia, and New Zealand. As this is before the 1940 German offensive in Western Europe, France had not yet suffered its humiliating defeat. European geography does reflect the German and Soviet gains of 1939, when Nazi Germany and the Soviet Union signed the Molotov-Ribbentrop Pact and divided Poland in half between themselves. The borders of Nazi Germany also reflect the Anschluss, the annexation of Austria in March 1938, and the occupation of Czechoslovakia, which took place in two steps. First, under the terms of the Munich Agreement, Nazi Germany occupied the Sudetenland (the northern and western border regions of Czechoslovakia), supposedly as a means of protecting ethnic Germans who lived there. Then in March 1939, the German army invaded the rest of Czechoslovakia and proclaimed it a Protectorate of the German Reich. Meanwhile, in Asia, war had been raging on and off since 1931, with the Second Sino-Japanese War between the Japanese and the Chinese 'officially' beginning in 1937. The Japanese puppet state of Mancukuo (Mandchoukouo), established in 1931 following the Mukden Incident, is the only immediately obvious clue to the fighting in Asia. The Japanese Mandates in the Mariana, Caroline, and Marshall Islands are labeled, but no hint of the critical role they will play in the Pacific War is noted. It is also important to note the, unremarkable, though important, presence of colonial labels throughout the map. For example, Vietnam, Laos and Cambodia are referred to simply as Indochine (Indochina), then a French colony, while India is the Indian Empire, the jewel of the British Empire. The political geography of Africa looks nothing like it does today, with French North Africa, French West Africa, French Equatorial Africa, Belgian Congo, and Italian East Africa among the many political entities that have ceased to exist since the creation of this map. Even the United States is included, with the Philippines labeled as an American possession, along with Guam, Wake Island, and the Hawaiian Islands, which were still a territory in 1939. Overall, this map provides a snapshot of the world as it stood in the fall of 1939 and the first few months of 1940. A world in chaos, marred by brutal warfare on three continents, with an uncertain future. Although undated, through the geography we are able to date this map to late 1939 or early 1940. It was printed by the French newspaper Le Petit Parisien. Le Petit Parisien (October 15, 1876 - August 17, 1944) was one of the main newspapers of the French Third Republic. On the eve of World War I, it was one of the four largest daily newspapers in France, along with Le Petit Journal, Le Matin, and Le Journal. Founded in 1876 by Louis Andrieux, it began as a radical leftist newspaper. In 1884 Jean Dupuy bought Le Petit Parisien, which would stay in the Dupuy family until it was suspended after World War II. At its most successful, just after the end of World War I, the paper had a distribution of 2 million copies, the largest circulation in the world at that time. Jean Dupuy died on December 31, 1919, and direction of the newspaper fell to his two sons, Pierre and Paul. On the eve of World War II, its circulation had begun to falter, but the newspaper was still in print and reported the news. The edition of June 11, 1940 of Le Petit Parisian would be the last ‘true’ edition of the paper to be printed in Paris. Following the Armistice, the paper remained in print, but began to feel the pressure of the Occupation and the Vichy regime. Eventually, Pierre Dupuy was convinced by German and French authorities to return to Paris and to continue printing Le Petit Parisien, but by February 1941, the newspaper had been completely coopted by the Germans and became a mouthpiece for the Occupation. A former worker at the time stated that the paper ceased to be le Petit Parisien, but became le Petit Berlinois. Dupuy, disgraced, left the newspaper, and went to Vichy. The Germans continued to print the newspaper, and continued to pressure Dupuy to sell them the paper. After the liberation of France, Dupuy and others who worked for the newspaper were arrested and charged with collaboration offenses. HIs trial did not begin until 1949, and he was finally acquitted in July 1951. The newspaper Parisien libéré replaced Le Petit Parisien after the war. Today’s newspaper, Le Parisien has its roots, particularly its naming rights, in the Petit Parisien, which were sold several times before being bought by Émilien Amaury, who founded Parisien libéré and, eventually, Le Parisien.